Featured Libraries Returns with Arlington Public Library, Lambton County and More! After a brief hiatus, our Featured Libraries post has returned! Summer reading programs are in full swing at our libraries, and we have some great examples of hoopla partner libraries going above and beyond to reach their patrons. The summer is a great time to communicate the services available at your library, and our Featured Libraries have done just that. Our friends at APL recently launched with patrons in June, and Shari Henry went on local ABC affiliate ABC7 to discuss the launch. APL Director Diane Kresh also wrote up a beautiful story on her blog as well, filled with links to personal recommendations. They also had a launch blowout with cookies, balloons and more. I’m getting hungry just writing this blog! APL has taken a hugely successful launch and turned that into over 900 registered hoopla users in just under a calendar month. Doubling down is usually reserved for the blackjack table, but MPLD has “doubled down” for the entire summer! During a special, summer promotion hoopla users at MPLD are able to borrow 10 titles instead of the usual 5. To celebrate this promotion, they have put up a special graphic on their website, along with sandwich board-esque signage and a hoopla flag in their library building. BCLS delivers in a very big way, with their newly adorned delivery trucks. These trucks can be seen across Bucks County, Pennsylvania delivering materials to their 18 locations. “Try Something New” is the slogan for this library, and they have definitely done so with these trucks! In Ontario, Lambton County Library has some very talented patrons in their community. At their launch event, “The hoopla at your library song!” was performed by Cory and Ben Sitek. This smooth, jazzy song is a great example of unique events held by libraries during their launch. Students from St. Patrick’s Catholic High School also put together real-life scenarios with the theme “hoopla Might Have the Answer.” Students fully produced this video, which further showcases the talented members of the Lambton County community. Our Featured Libraries for April include Topeka, Lafourche and Midpointe! Brace yourself, summer is coming! And that means summer reading programs and all sorts of patron-engaging activities. This summer, we want to see the fun and novel ways you are reaching your patrons. If your library is doing a summer reading program, we want to hear about it! If you’re throwing a big summer bash, we want all the details. Anything you’re planning to connect with your community this season, let us know! 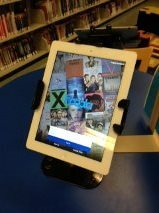 "Library News" newsletter from T&SCPL! To celebrate their launch to patrons, WMDT 47 in Salisbury, Maryland had Adult Service Manager Scott Mahler on to discuss hoopla. On their daily morning show, Good Morning Delmarva, Scott and host Lenita Wesson discuss the hoopla service and Wicomico Public Library. Our friends in Middletown, Ohio gave away a “movie night prize pack” with hoopla gear and snacks and treats for a night-in on the library. They gave this basket away at their local All American Expo. Fun, exciting activities are another great way to connect with patrons young and old. In Lafourche Parish, hoop-la toss is the name of the game. With this library-made ring hoop-la toss game, kids have a unique way to connect with hoopla at Lafourche Parish Library. LPL also has some great-looking fashion models with excellent taste in t-shirts. Here are some additional images and assets libraries are using to connect with card holders both online and their brick and mortar locations.